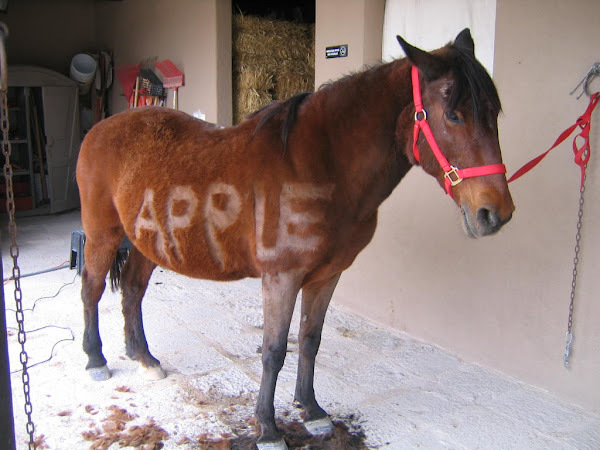 Apple turned eight. 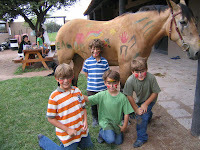 Her birthday party was at Nicole´s ranch. 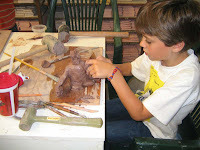 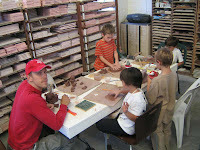 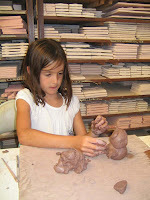 At last week´s camp, a highlight was the scavenger hunt, as was sculpting with clay in Lucinda´s ceramic and tile studio. 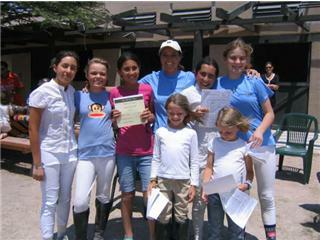 Former representative of the Mexican Dressage Team at the 1996 Olympics Joaquin Orth gave a clinic in San Miguel the weekend of July 12-13. 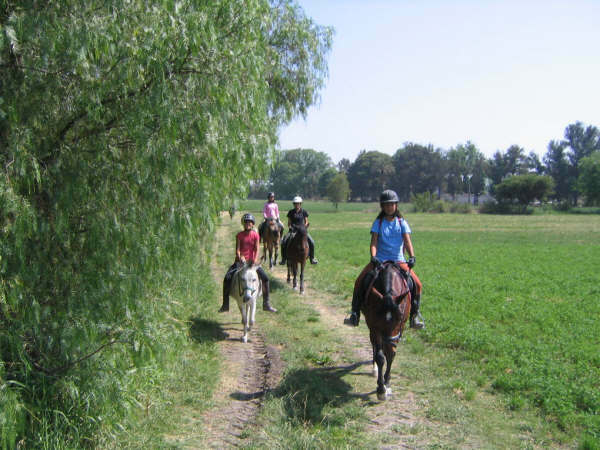 Carla and Fernanda were the lucky ones to have private classes with Joaquin, who emphasized bending the horse´s neck in the direction of his trajectory, something, both pony clubbers, ahem, have heard before. 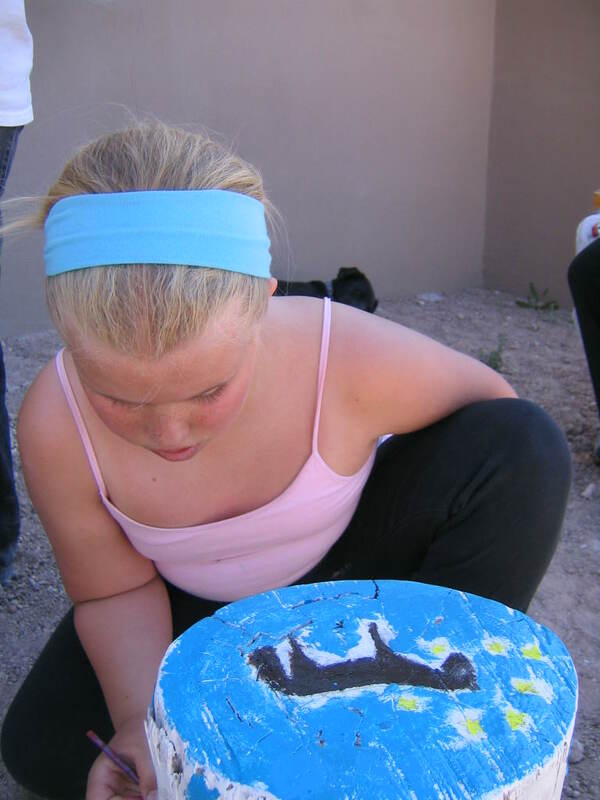 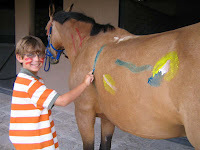 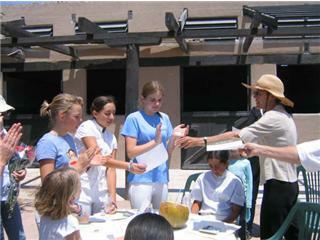 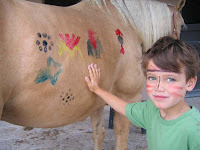 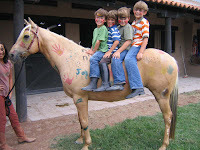 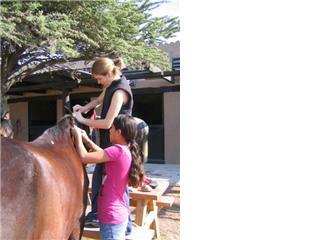 Despite days of heavy rain, kids at Horse Camp at Las Animas groomed the horses, learned to put on tack, rode and at week´s end, painted the horses. 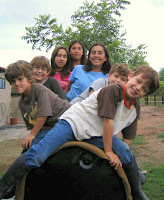 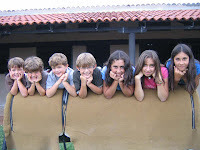 Campers were Bennett, William, Joseph and Reagor and the counselors were Carla, Fernanda and Sean. 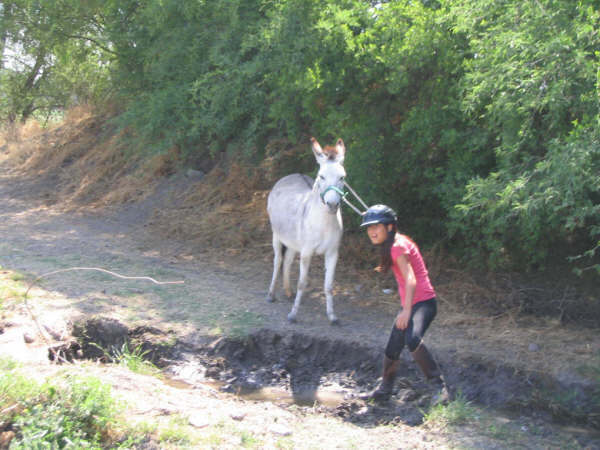 There are two things Nicole can´t resist: rescuing puppies and buying good ponies. 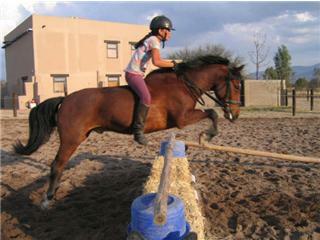 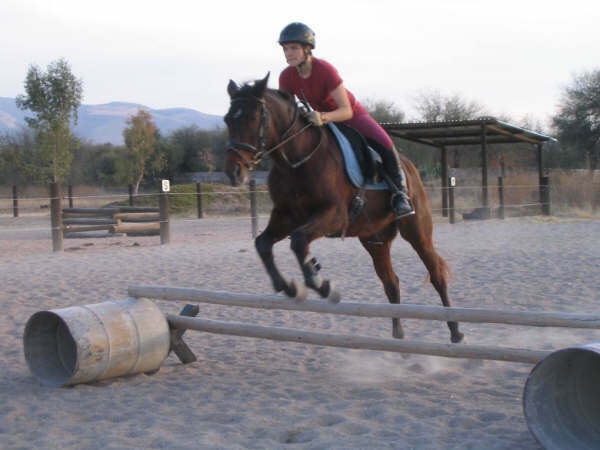 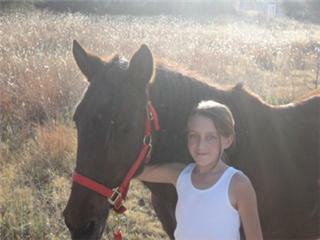 Cisco is a five year old gelding who came from the campo. 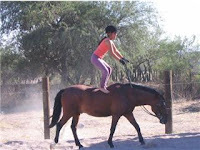 Nicole got excited about his gaits when she tried him out in charro tack. 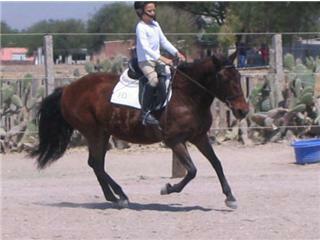 Charro refers to the Mexican rodeo tradition. 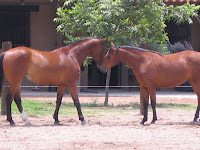 Once at Rancho Las Animas, Cisco tried out the sand in the arena, and got to know Banderilla, Nicole´s filly who just turned two in June. 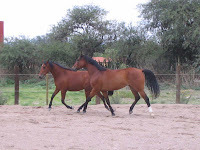 Banderilla decided Cisco was a stud, or at least a good playmate. 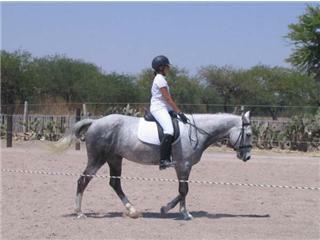 Meantime, Nicole has Cisco under dressage saddle. 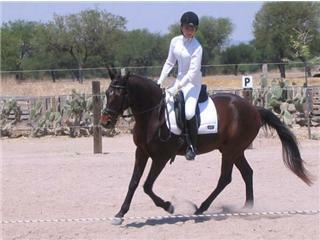 She is excited about his performance and predicts a stellar future. 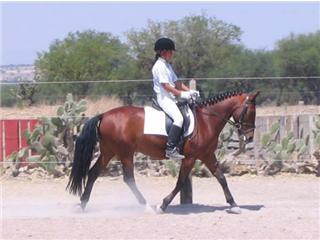 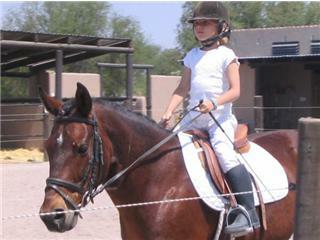 She`ll continue training him in dressage, and thinks he will soon be a fantastic dressage pony for a lucky youngster. 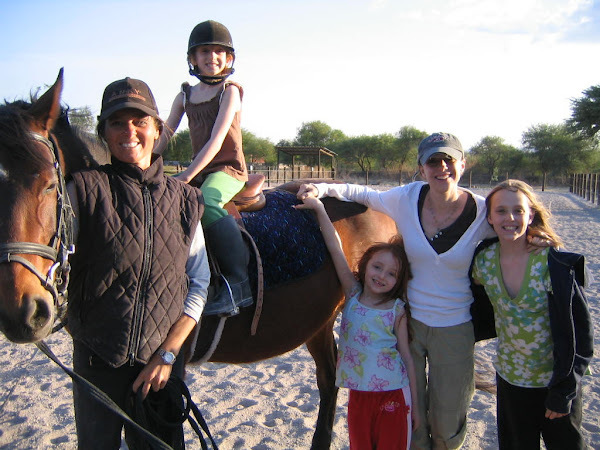 Carolita is in Texas for the summer already and Jen is going soon, but the Pony Club had somebody new this past week - visiting French dressage trainer Dany Bert, by way of California. 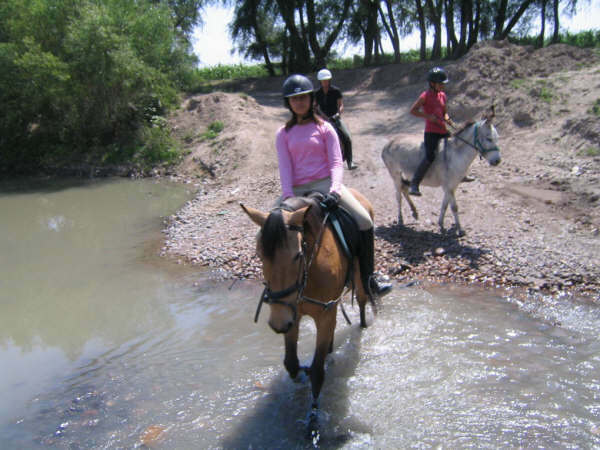 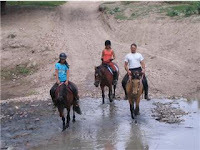 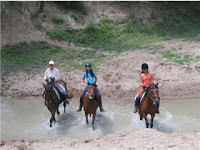 Nicole (left, crossing the Rio Laja on Vaquero with Sean on Retta and Carla on Lucky) invited him on one of the group's fabulous Saturday trail rides into the Cieneguita area. 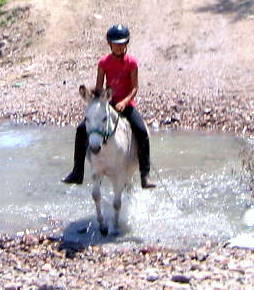 Dany rode Carolita´s Savanah. 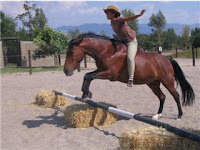 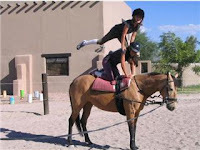 Why Shouldn´t You Stand On Your Horse? 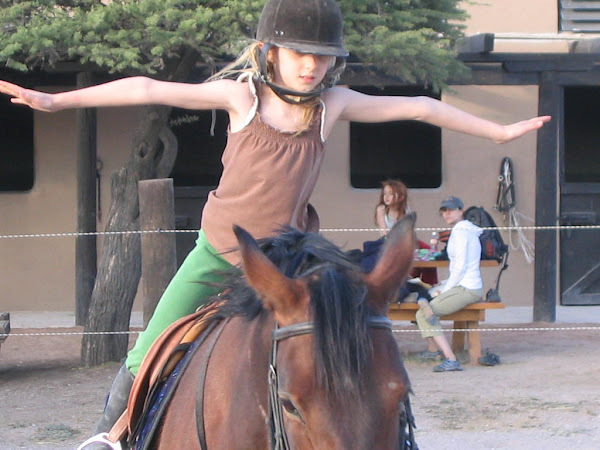 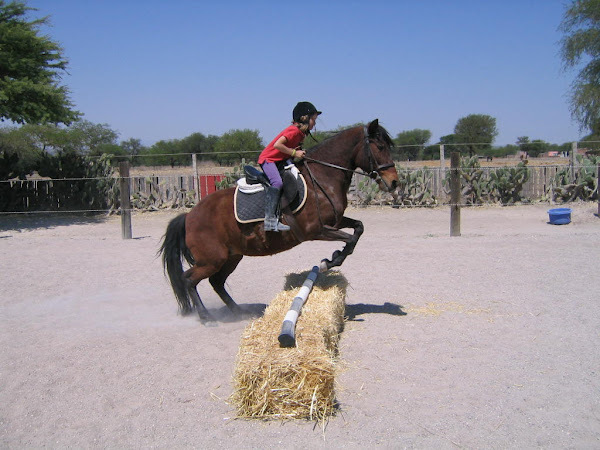 Nicole likes to start beginners with some vaulting - exercises with a surcingle instead of a saddle, that is, so she wanted to warm the horses up for vaulting for July´s summer camp. 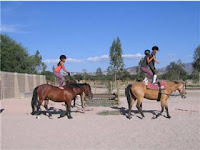 Sean, Carolita and Carla volunteered to help this past week, and next thing you know, they were flipping around on their horses as if they were in the Olympics or the circus or a Western. 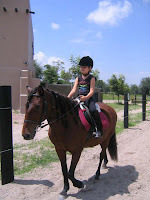 or email Nicole at ponyclublasanimas@yahoo.com. 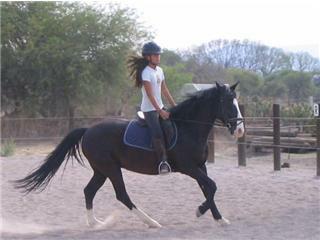 Carla has been working with Lucky on their relationship. 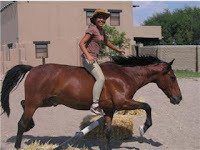 The result is what you see in the photos...he will walk, trot, canter and jump when she asks using only her seat. 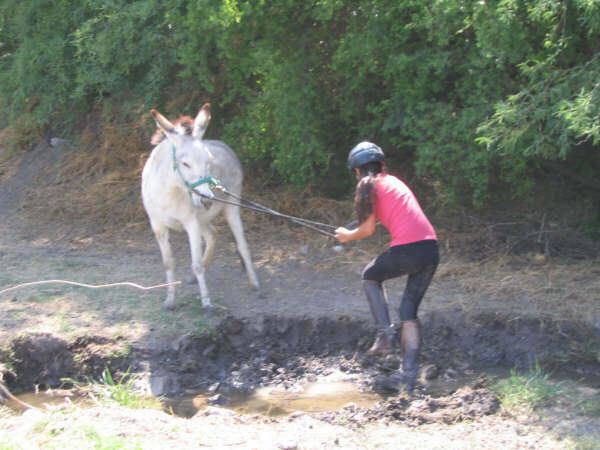 Come on, it's only a foot wide. 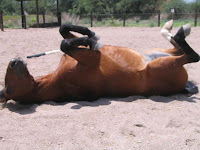 You're not going to make me! 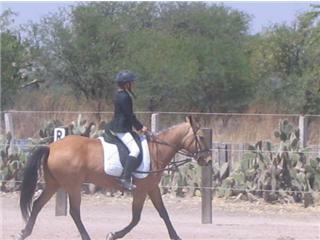 Fernanda and Muneca´s first time competing together. 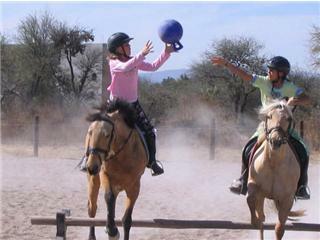 Everyone scored 60 and above! 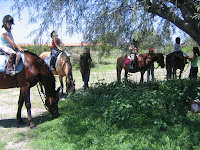 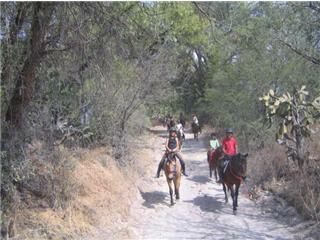 My heart is with my horse in Mexico! 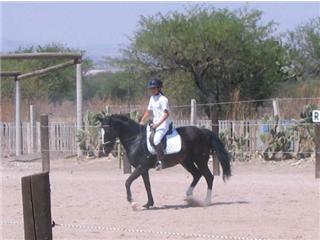 Andale means Go! 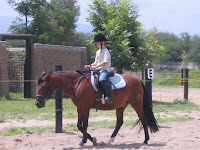 He loves to. 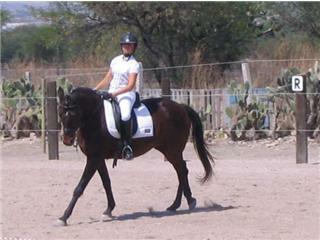 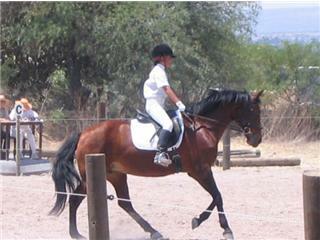 Iza has competed on Vaquero before. 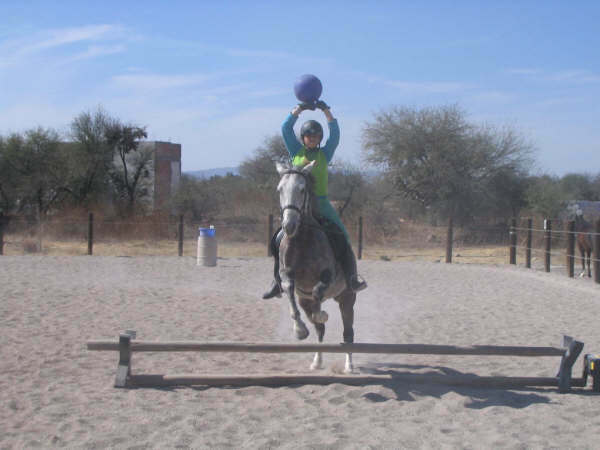 Sean on Dumburi and Carolita on Savana Jumping with Ball. 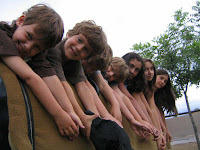 Pajama Day. 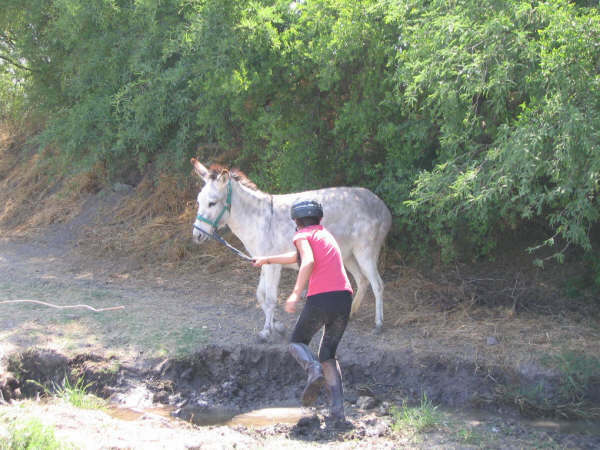 NBA scouts have been watching these two.